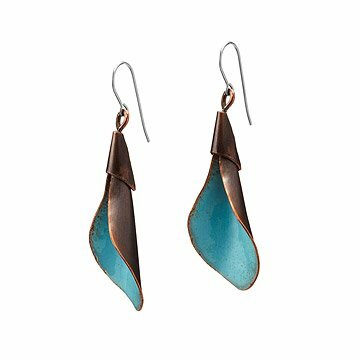 These sculptural calla lily earrings are handcrafted from copper and accented with turquoise enamel. The elegant flowers of the calla lily have the ability to remain in bloom year round, making them the perfect symbol of enduring beauty. These earrings translate that beauty into an even more lasting medium: handcrafted copper. Metal artist Alexis Archibald uses recycled copper with a rich patina to form the familiar, coiled shape of the calla blossom. Inside is another copper petal that is hand enameled a dusty shade of turquoise. The blossoms are then suspended from sterling silver filled wire, for a look that is contemporary and always fresh. Handmade in San Diego, California. Check out Alexis' Calla Lily Necklace Here. Alexis Archibald grew up in Pittsburgh, PA where she developed her passion for art. She received her BFA, with a concentration in metalsmithing, as well as a teaching credential in Art K-12 from Edinboro University of Pennsylvania. After graduating from Edinboro University in 2004, she taught art in Pittsburgh city high schools. She has been recognized and nominated in numerous art exhibitions and scholarships throughout her career. While living in San Diego, she has been teaching art in elementary schools, and is an active artist within the community. Alexis just completed her MFA at San Diego State University and works out of her studio in San Diego, creating jewelry and sculpture. These earrings are just gorgeous. They're clearly handmade - the glaze has certain imperfections that adds to the charm. They're good size but not too big. They make my outfits feel special but aren't loud "look at me" type of jewelry. Love them. A couple of small knocks: one is that the way the wire is embedded in the flower means that it twists out of position often - at least once or twice a day - which means that I could be walking around with the cala lily facing behind me instead of front / slightly aside. The second is that the hooks are silver tone, which doesn't quite go with the bronze tone of the rest of the earrings. One earring was not aligned properly. When it was put on, it was backwards. Had to manually open the hook and reset it. The craftsman/-woman was not very detail oriented. One is also slightly bigger than the other, there is a lack of symmetry. Colors are however dazzling and they go great with everything. Gift was beautiful. The earrings have wonderful coloring. They are strong but look delicate. Nothing wrong with these earrings. This was a great gift. I couldn't be happier with it. I have worn these earrings twice and have received compliments both times. Although they have some weight to them they are comfortable. Because they are so unique it makes them a conversation starter. I really do love them!